The government has been forced to launch a big attack on the rights of workers, especially on their pension entitlement. In the summer they announced that workers in Belgium were taking up their pension too quickly. Because of the sharp rise in the ageing of the population everybody would have to work longer to sustain our social security system, otherwise it would collapse. The other side of the story is that Belgian workers are on average more productive than on a European level; when they take early retirement they are already worn out. Also, for the past twenty years, in order to stimulate the economy and job creation, the different governments have given the bosses enormous reductions in the amount they have to pay to social security and to taxes. By lowering the amount available for the work-force when they retire, this amounts to an indirect attack on wages. Today more than a million people are unemployed or underemployed in Belgium. The only thing that changed is the profits, which have been rising significantly in the last few years. These proposals meant that the leadership of the unions was confronted with enormous anger from the rank and file. They were pushed far further than they ever wanted to go. For the first time in twelve years, Belgian society was confronted with a general strike - two in one month actually - with one of the biggest demonstrations of workers seen in years. Thousands marched into the streets. This resistance was also reflected in a growing hatred and anger towards the Social Democrats, who have been in government for almost twenty years. Union leaders are now forced to put in question their relationship with them and with the Christian Democrats. There is a growing, critical minority among the working class who are looking for an alternative. The neo-liberal offensive has for years worsened the situation for Belgian workers, especially female workers who have been far more touched by unemployment, attacks on benefits and underemployment. 40% of working women now work part time. Single parent families are hard hit by poverty; 80% of single parent families with a female parent are officially poor. More and more women are found in very flexible, low paid and insecure jobs. And then there is the pensions question. In the ‘90s a decision was taken by the government that women would also have to have a career of 45 years instead of 40 years as before. This would go up in stages and in 2007 everyone in Belgium will have to work for 45 years to get a full pension. A lot of women work part time and often lose a few years when the children come along as child care would easily cost you half or more of your wages. So already a lot of women were not able to assure a full pension for themselves. Now it will be almost impossible for women to get it. The recently proposed "Generation Pact" which led to the two general strikes in October last year, was an attempt to break the early retirement system (among others). The new arrangement on early retirement (pre-pension) means that the big majority of women - 70% according to the unions - will not be able to get it. The strikes forced the government to make concessions. A big one is new negotiations on the jobs that would get exceptional pre-pension arrangements - so-called ‘hard jobs’ - and on periods in which you did not work being ‘equalised periods’, counted in the career years. So it is possible that the huge figure for women not qualifying will go down. Definitely some professions in the health sector, like nurses, will count as ‘hard jobs’. It is clear however that these new negotiations will not save all women’s pre-pension rights. The strikes and the growing radicalisation have had an effect on working women. For a lot of young female workers it was their first time on a picket line, in an open confrontation with their bosses and the government. We always said that in the process of taking part in the class struggle, female workers would start to question their own lives and the difficulties they face. This process is already underway. For example, the World March of Women took place also in October last year. 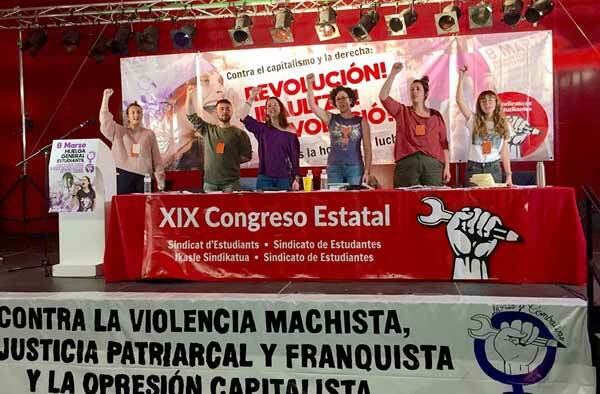 It is usually dominated by the bourgeois and petty bourgeois feminists, but this time we saw a huge presence of trade union women, who formed two very animated and combative blocks in the demonstration, carrying placards with demands on pensions, wages, and broader social demands. We are organising an event on International Women’s Day aimed at attracting a new layer of radicalised women to the ideas of socialism. We aim to have 100 present. The main theme is "The emancipation of women: victims of 25 years of neo-liberalism". There will be workshops about how to fight violence in the family and a report of the Campaign Against Domestic Violence with Sinead from Scotland speaking. Recently, in our anti-fascist work, especially around the demonstrations against the NSV - the unofficial student group of the Vlaams Belang - and the economic congress of the Vlaams Belang, we produced an article on their programme on women. It involves a serious attack on women’s independence, wages, social rights and reproductive rights. We will also have a campaigning day (all the branches separately) on the 8th of March, having stalls around this theme at universities, in busy streets, at stations. Where we’ve got the strength, we will also try and mobilise at workplaces where a lot of women work (hospitals, supermarkets) to sell our paper and give out leaflets.